McDonald’s twice in one week? I know. I apologize. This was one of those unplanned stops. J and I left Waldo Stadium about halfway through the third quarter to avoid the incoming rain. Somehow, I ended up back in Portage after leaving the stadium, so we came home I-94 to Westnedge. About the time we were getting to our turn, J said she was still hungry. I didn’t want to say anything, but I was too. We had only eaten a slice of pizza and some popcorn at the game and didn’t have much of a lunch. 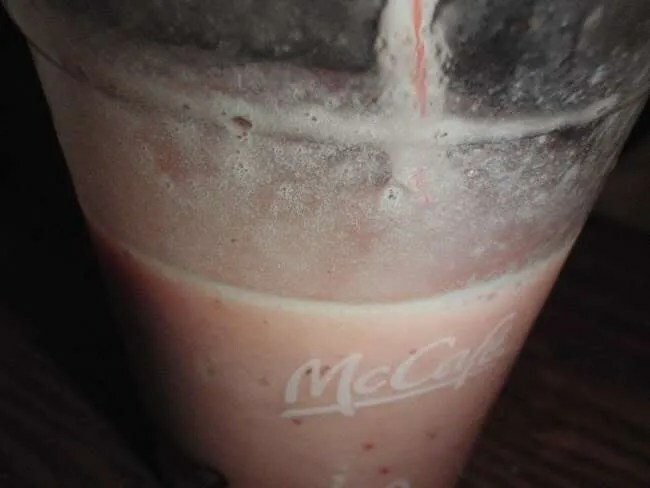 J was craving a smoothie and the only place we could think of at 10:00 at night that would have a smoothie was McDonald’s. 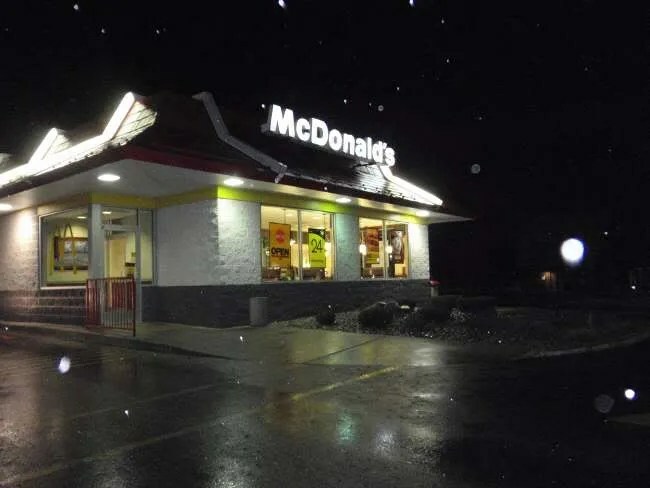 We knew there was one just a mile or so down the road, so we skipped our turn and headed to the golden arches. 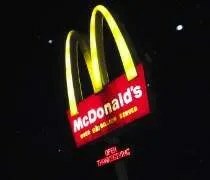 McDonald’s in the South Westnedge neighborhood is on South Westnedge near Elys Way. Like I mentioned in my McDonald’s review earlier this week, I hate drive thrus, so we parked and headed in. The restaurant is open 24 hours, but the lobby closes at 11:00. We got there ahead of that, so I wasn’t forced to argue with a speaker because neither of us can understand each other. I was pretty predictable again. Double 1/4lber meal with a Sprite. I did not make it a large this time though. I don’t need that many empty calories that late at night, but I needed something substantial. 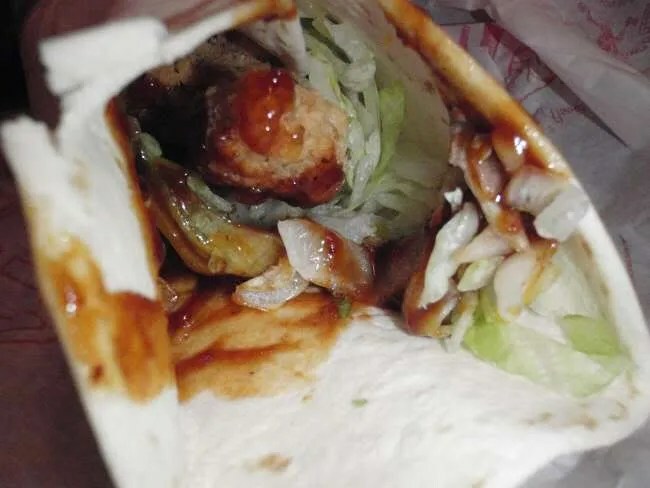 J ordered a small strawberry/banana smoothie and a Chipotle BBQ Snack Wrap with crispy chicken. Our bill was under $10. We took it to go so we could get home. We were both good and actually waited until we got home to eat….except for the few fries J stole from me. My burger was what I expected and what I always enjoy from McDonald’s. No surprises. J said her chicken wrap was pretty spicy. I didn’t take a bite, so you’ll just have to take her word on it. I could smell the smoothie, but I don’t really like bananas or strawberries. She enjoyed them both. I said it last time, I’ll say it again. McDonald’s is what it is. It’s cheap. It’s quick. It’s consistent.